Image credit & copyright: NASA/Bill Ingalls. Launch Alert! 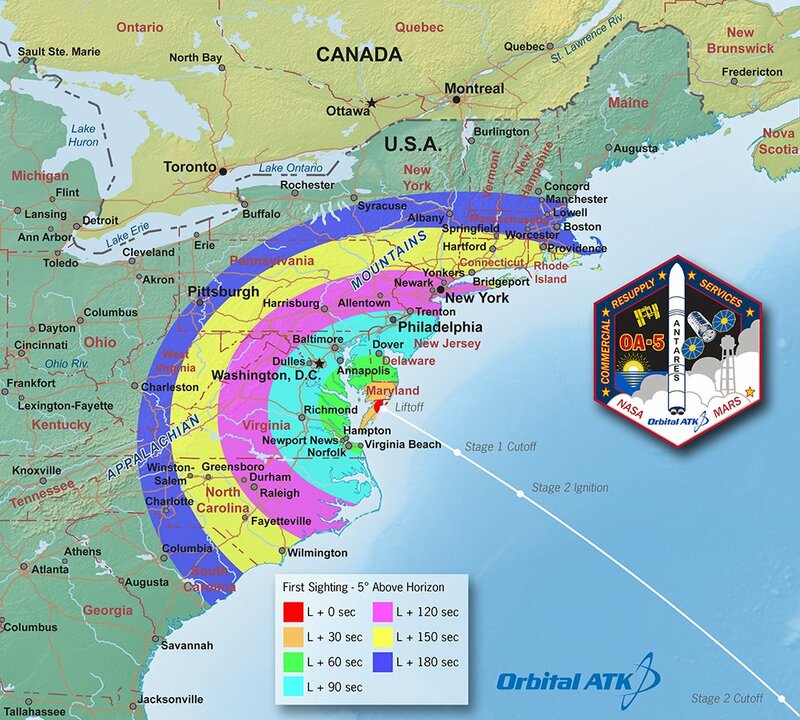 : Sunday, October 16 at 20:03 EDT (00:03 UTC on the 17th) Orbital ATK will return their Antares rocket to flight with the launch of OA-5, International Space Station (ISS) resupply mission from Launch Pad-0A (LP-0A) at Wallops Flight Facility (WFF), Mid-Atlantic Regional Spaceport (MARS), Virginia. This will be the 6th launch of the Antares rocket and the first launch in its new Antares 230 configuration. This will also be the 6th of 10 contracted launches of Orbital ATK’s Cygnus cargo spacecraft and the 3rd “enhanced” version of Cygnus. The first two “enhanced” Cygnus spacecraft, (S.S. Deke Slayton II on OA-4 and S.S. Rick Husband on OA-6) were launched by the United Launch Alliance (ULA) on their Atlas V rocket from Cape Canaveral, FL while the company was upgrading Antares from the Antares 130 to the Antares 230 and while the company itself morphed from Orbital Sciences into Orbital ATK. You will also notice that the mission designations have changed from “Orb” to “OA” designations. After rendezvous with Station, it will be grappled via Canadarm-2 and berthed to the Earth facing (nadir) side of the Unity Module (Node-1). It will remain for approximately one month before being loaded with waste and released to disintegrate in Earth’s atmosphere. As with every Cygnus flight, it’s been given a name to honor someone in the industry. This missions (OA-5) Cygnus vehicle has been designated the S.S. Alan G. Poindexter. Alan “Dex” Poindexter was a U.S. Navy Captain who, at the time of hire by NASA, had logged more than 4,000 flight hours in over 30 different types of aircraft and successfully completed more than 450 aircraft carrier landings. 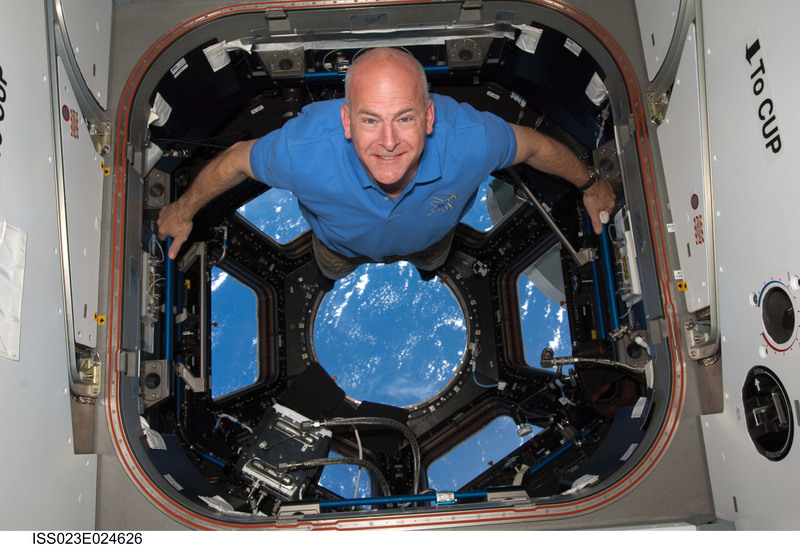 His career as a NASA astronaut included two shuttle flights (STS-122 Atlantis and STS-131 Discovery) to help build, upgrade and repair the International Space Station (ISS). Dex was sadly killed in the summer of 2012 in a jet-ski accident. He is survived by his wife, Lisa and two sons, Zachary and Samuel. Cygnus Spacecraft: is an expendable, unmanned, pressurized cargo re-supply spacecraft that’s 6.3 m (21 ft.) in length by 3.07 m (10.1 ft.) in diameter. 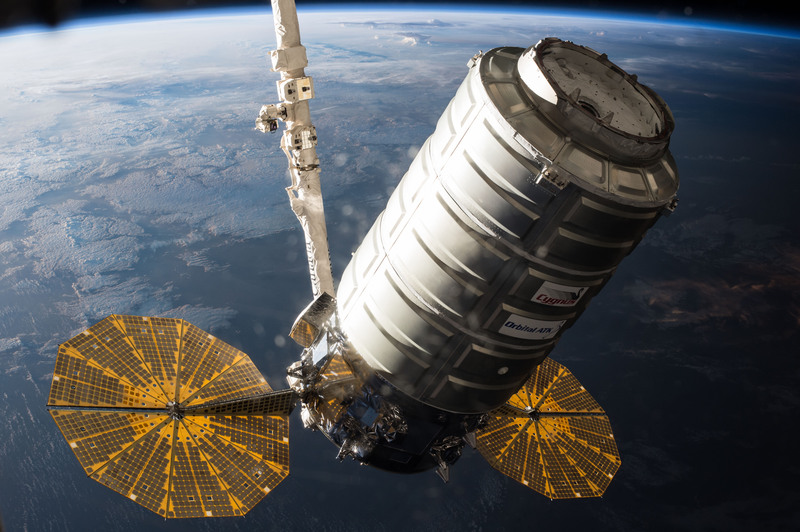 This iteration of Cygnus boasts a great increase in payload capacity (roughly 7,600 lbs. or 3,500 kg) due to the increased size of the ship with its stretched or “enhanced” Pressurized Cargo Module (PCM) as well as lighter weight components such as the ATK Ultraflex solar arrays. Orbital ATK Antares 230 Rocket: Formerly known as Taurus II, the Antares Launch Vehicle is a 2 stage (with optional third stage) medium-lift rocket. It stands 40.5 meters (132.8ft) high and is 3.9 meters (12.9ft) in diameter. The (1-2-0) numbering system for Antares goes as follows: 1) Two standard AJ26-62 first stage engines. 2) Castor 30B second stage engine. 0) Third stage not utilized. Main Payload Fairing (PLF): Two-shell composite 9.9 m (32.5ft.) high and 3.9 m (12.8ft.) in diameter. Third Stage (optional): There are two optional third stage variations for the Antares 230; the STAR 48-Based Third Stage (48BV) and the Bi-Propellant Third Stage (BTS). Neither of these will be used during this flight. Second Stage: 4.2 m (13.8ft.) in height and 2.3 m (7.5 ft.) in diameter. It’s powered by a single Orbital ATK CASTOR-30XL (CASTOR 120 heritage) solid fueled engine with thrust vectoring capability that burns for 127 seconds. The CASTOR-30XL replaced the Castor 30B which can still be used mission permitting. First Core/Boost Stage: is 27.6 m (90.5 ft.) in height and 3.9 m (12.8ft.) in diameter and is powered by 2 Russian RD-181 engines built by NPO Energomash. They utilize liquid oxygen (LOX) as oxidizer and Rocket Propellant 1 (LP-1) kerosene and has a burn time of 215 seconds. 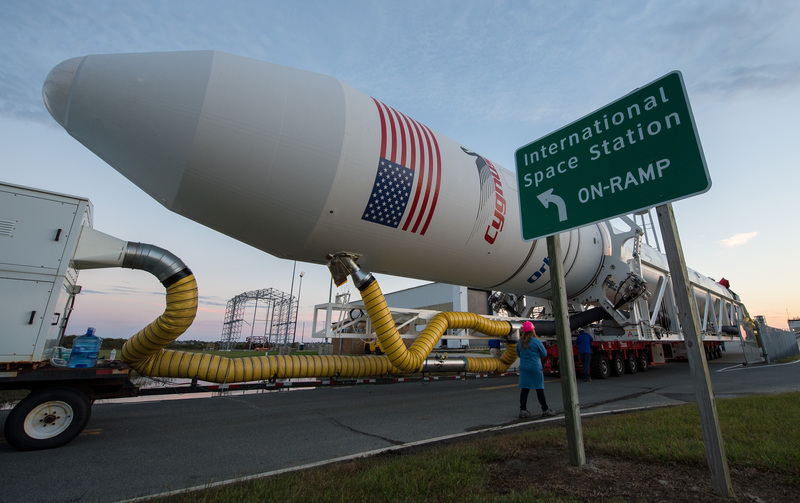 Go ANTARES – Go CASTOR – Go CYGNUS & Go OA-5! Image | This entry was posted in Images, Launches, News, People, Spaceflight Companies & Vehicles and tagged Alan Poindexter, Antares, Antares 230, International Space Station, ISS, NASA, OA 5, OA5, Orbital ATK, OrbitalATK, Space, Space Station, VA, Virginia. Bookmark the permalink.